Courtney's Candles has offered every Clayworks item created by Heather Goldminc since they first became available in 2000. 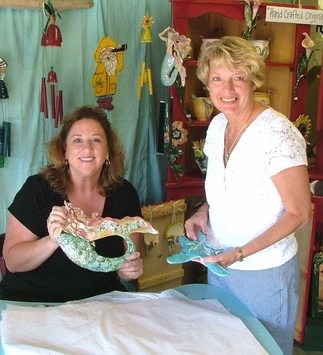 Wilma fell in love with Heather's Clayworks at first sight! Courtney's offers the most complete collection of Clayworks available anywhere! Brand new item? Retired item? In the highly unlikely event that we don't have it in stock, we'll do our best to find it. If your desired item is gone forever, Heather can recreate a custom one just for you. Check out our Clayworks Studio Originals, an exclusive of Courtney's Candles. We have had the distinct and rare privilege of meeting with Heather Goldminc and her husband Marc at several gift markets and have become good friends over the years. We recently visited their lovely beach front home/studio on Vancouver Island in British Columbia. Heather is so nice. She and Wilma got along great from the very first second. Heather has signed our personal Four Seasons and First Christmas candle houses, a Rambling Rose castle for Roxanna, Wilma’s mom, and two candle houses for Courtney, a July Birthday Cake and a Kitty’s Treehouse. We really enjoyed talking to Marc about the “old days” before Blue Sky, when Heather & Marc rushed around trying to keep local BC showrooms from running out of candle houses and had neighbors knocking on their door at all hours looking to buy a piece for a last minute special gift. Blue Sky is a California based company that takes Heather's designs and produces them in volume with artisans based in China. Blue Sky sells other items besides Clayworks, so there are many items that are Blue Sky but are not Clayworks by Heather Goldminc. Heather and Marc have a son in the Canadian military and a teenage daughter named Rachel. Heather has selected Courtneys to be the exclusive retailer for her Clayworks Studio Originals Collection.. The Studio Originals are all hand-made by Heather in her studio in British Columbia. Heather also creates custom candle houses ! You can specify the colors, titles, flowers, etc on your custom candle house. We stay in regular contact with Heather. She loves getting feedback from customers. We cannot give out Heather's email address, but frequently forward emails with comments, suggestions or questions from customers. If you are going to be in British Columbia and would like to visit Heather's Studio, drop us an email and we'll set it up for you. We passed along an email from a fan (named Ashley) who wanted to do a school project on Heather's "Ashley" in the My Hometown Collection. Click the link below to see Heather's response.